I first heard this concept when our second President Gregory Baker Wolfe used it as a reference point at one of the many commencements that he led during his term as our leader (1979-86). What a fascinating way to describe some of the many passions that drive our academic life. But it has stuck with me. Through the years, our efforts have pivoted around creating our version of the life of the mind: dedication to building a cosmopolitan liberal arts curriculum, critical thinking pedagogies, the creation and propagation of affinity symbols for our institution (we are Worlds Ahead – a university seal, trademark and logo, repeated mantras defining our culture, a university mascot, special colors, and a distinct architectural eclecticism) and our more recent student and curricular initiatives around global learning. Throughout this period, our built environment has expanded enormously to accommodate the physical consequences of the maturation of our version of the “life of the mind.” Space has been dedicated to classrooms, laboratories, libraries and archives, computer-related initiatives, physical health, athletics and wellness (largely through physical fitness). Only more recently have we had the foresight and resources to build more “collision spaces” and gathering areas. We understand that social exchange is critical to the life of the mind. Many of the universities against which we model our curriculum and physicality have origins in faith-based initiatives and initiators. Despite the evolution of church and state dynamics, and despite the importance of secular education as a driving force for modernization, we know that spirituality is an important if not central dimension to human development. A commentator from an earlier time reminds us to “refuse to be average or to surrender to the chill of your spiritual environment.” In many ways our spiritual environment at FIU can and should be warmed. The university’s diversity and its global mix of students provides a vibrant laboratory for the cultivation of spiritual strength and understanding among students and professional staff alike. FIU has a variety of active faith-based groups and hard-working student clubs that focus on cultivating spiritual strength and ethics. A shared space for discovery and understanding would facilitate their work. 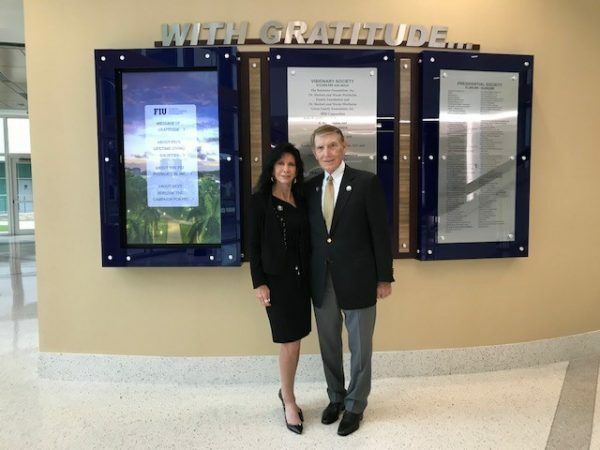 To accommodate the plurality of faiths and perspectives at FIU, we are proud to announce that local philanthropists and humanitarians Trish and Dan Bell have stepped forward with a $5 million donation to help our FIU build a non-denominational chapel, a sanctuary from the fast pace of university life. Interfaith centers are not inherently temples, mosques, synagogues, churches, or gurdwaras, but welcoming places for all faiths and for spiritual exploration. Meeting the needs of different faiths, the sacred spaces within interfaith centers are distinct. They are symbolic of the pluralism and diversity that public institutions must embrace. This chapel will serve as an interfaith gathering place for worship, contemplation, spiritual strengthening and understanding. It will offer a space for ceremonies, spiritual lectures, leadership enhancement and discussions, and individual reflection. As the percentage of non-religious affiliates in the United States likely increases over the next few years, the chapel will serve as an important center for spirituality, which is on the rise according to a recent Pew survey: the percentage of Americans who felt a “deep sense of spiritual well-being” has increased to nearly sixty percent. The proposed chapel location and design are still being conceptualized, but we hope for it to hold up to 250 seated people, have sufficient meeting space for students in our interfaith community, feature a conference room for meetings of group leaders and others who seek a spiritual approach to their problem solving or who are teaching spiritual/religious studies subject matter. As caring human beings, we have the obligation and opportunity to make the world a better place. At FIU we do this one student at a time, every day trying to enhance knowledge and appreciation for all the blessings that our education and our institution can give us. Creating this dedicated space for spiritual exercise and renewal at FIU will help us in our quest to continue to turn the impossible into the inevitable and in the process make the world a better place for our sons and daughters and others who follow in our footsteps! As a graduate of FIU and now an Ordained Lutheran Pastor, I am very pleased to read about this! Dear Mr. and Mrs. Bell, Thank you very much for your kindness and the richest of your hearts. The prosperity of the soul is as important or equally important as the prosperity in education and finances. Having a place and space for the development of our spiritually inside the house, FIU, make us feel saved, and secure. We can trust that students will receive or encounter the best. Again, thank you, God Bless you Shalom Shalom !!!! Thank you so much Mr. and Mrs Bell for your generosity. Indeed, this is a timely announcement for I truly believe that we cannot separate our mind from our soul and awareness of humans as spiritual beings is an important component in the development of the students ( young and old) at FIU. Love and compassion is at the heart of making this world a better place and your acts are commendable. This is wonderful news! I appreciate Mr. and Mrs. Bell for this concept and great gesture of sacrifice, to incorporate spirituality, in a collegiate setting. May God bless you! What an excellent idea. That you Mr. and Mrs. Bell. I am an FIU graduate ’08 EdD and a former employee who participated in Bible studies on campus and developed strong friendships founded on strong belief in a creator. Our students and staff need to see that their faith is respected and honored — I am sure the FIU Chapel will be a powerful reminder that there is a creator and we are loved divinely. This is a great addition to FIU. However, as an alumna of the northern campus, I think Bay Vista should also have such a facility. May the Almighty God bless them more abundantly in Jesus name. As an Alumna of FIU and a believer, their names will be written down forever in gold. Thank you for this wonderful gift and for acknowledging the importance of spiritual well-being to our students success! While the donation is well appreciated, I don’t believe any type of chapel, be it interfaith or not, belongs on a public university campus. There are so many ways the $5 million could be better spent at FIU. Miami is a large city. There are enough churches, synagogues, mosques etc. to accommodate each faith. Religion is taught on campus as academic subjects, not faith-based or spiritual. Thanks to the Bells for their generous donation, to President Rosenberg, and to you Duane for keeping me informed. I cannot longer assist to the events because of my health but I like to keep up with FIU. I think the chapel is a beautiful idea and we need it badly. Especiallybin these trying times. God Bless! Exactly thank to Trish and Dan Bell.. America needs to put the American flag out on the front porch and God at the dinner table. All of us need today more than ever to get in touch with spirituality what better place than in a place of learning reachable to all of all faiths a teaching place a safe place for all. God Bless is all and God Bless the Bells for this special gift. FIU and the people who are blessed to be here are truly blessed .